KIEV, Ukraine -- Kiev Mayor Vitali Klitschko has described the fight against corruption in Ukraine as an "illusion," and called on the country's general prosecutor to jail more offenders. Klitschko, the former heavyweight boxing champion who was first elected mayor of Ukraine's capital city in 2014, spoke with VICE News at the annual World Economic Forum in Davos, Switzerland. "The fight against corruption, it has to have clear rules — if somebody broke the rules, they have to take responsibility for that," said Klitschko. But the onus, he said, was on the country's widely-maligned general prosecutor, Viktor Shokin. "It's a problem, because the people expect, they [were] told [there would be] a fight against corruption, but it is illusion," he said. Klitschko's comments come amid increased scrutiny from Ukraine's Western allies, including the US, for failing to follow through on prosecutions after the Maidan revolution in early 2014. In September, American ambassador to Kiev Geoffrey Pyatt called out Shokin in front of business leaders gathered in the Ukrainian city of Odessa. Shokin's staff, said Pyatt, were "openly and aggressively undermining reform." "There is one glaring problem that threatens all of the good work that regional leaders here in Odessa, in Kharkiv, in Lviv and elsewhere are doing," said Pyatt. "That obstacle is the failure of the institution of the Prosecutor General of Ukraine to successfully fight internal corruption." Pyatt went on to highlight allegations levied against former Ecology Minister Mykola Zlochevsky, who is also the owner of the energy company Burisma Holdings. Zlochevsky is accused of stealing $23 million — money that was order seized by a UK court. Shokin's office has been slow to assist British authorities, which Pyatt condemned. An added wrinkle to the Zlochevsky case is the employment of US Vice President Joe Biden's son Hunter, who serves on the board of Burma. The company denies the hire was meant to influence or forestall possible investigations. Public opinion polls in Ukraine show that few citizens believe the new pro-Western government has sufficiently tackled bribery and graft. In December, Prime Minister Arseniy Yatsenyuk was tackled by a parliamentarian during a speech in which he deflected criticism that the cabinet was not doing enough to fight corruption. Klitschko, who was a leading figure in protests that saw the ouster of Ukraine's Kremlin-friendly President Viktor Yanukovych, said corruption was only one of the obstacles facing the country. Ukraine, he said, needed more time to meet its debt payments, including billions owed after a Western-led bailout. "Our economy right now is not healthy, and it is very difficult with all conditions we need a little bit more time, less interest," he said. "We need more air for breathing." The mayor was part of a large Ukrainian delegation in Davos, including President Petro Poroshenko. On Thursday, Poroshenko met with the US vice president. According to Biden's office, the two discussed implementation of the September 2014 Minsk agreement aimed at ending fighting in eastern Ukraine. Fighting between Russia-backed separatists and Kiev's military continues sporadically, but front lines have remained mostly unchanged since last fall. Much of the talk at the World Economic Forum this year centered on plummeting oil prices, which have gravely weakened the economies of many dependent countries, including Russia. In his interview, Klitschko said Western countries had to double down on existing sanctions against Moscow at a time of possible Russian weakness. "The sanctions have to be prolonged," he said. "Everyone understands without money supporting separatists, without [the] propaganda war, brainwashing, without weapons deliveries," this conflict would never happen, said Klitschko, referencing Russia's role in Ukraine's east. The media, he said, "is the most important and dangerous weapon," claiming that the Russian press swayed the public toward supporting the Kremlin's military activities in Ukraine. "We Ukrainians don't want to go back to the USSR," he said. "We see our future in the European Union, as a European democratic country. It is our main goal." The 6'7" Klitschko met VICE News after a closed-door meeting with investors. Already a veteran of Davos — he's been more than five times — the mayor said he came to sell Kiev to businesspeople gathered at the Swiss alpine town. "A lot of networking," he said, describing the four day conference. In 2014, Klitschko was a leading candidate in presidential elections before he pulled out and backed Poroshenko. Asked if he had aspirations of once more running for Ukraine's highest office, he said there was "no reason" to talk about it. 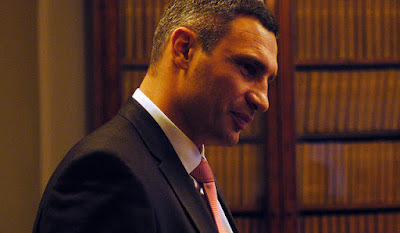 "It was just two months I was re-elected," said Klitschko. "The Kiev citizens trust me." Paraphrasing a joke his friend told him, the former boxer poured more cold water on the idea, asking, "How many presidents [are there] in the world, how many mayors… how many world champions?"